Disclaimer: I know this version in Singapore is censored. Approximately 8-15 minutes (reports varies) have been cut off. Pity. This is easily one of the most tragically Romantic (yes, with a capital "R") movie that I have ever watched in a long, long time. 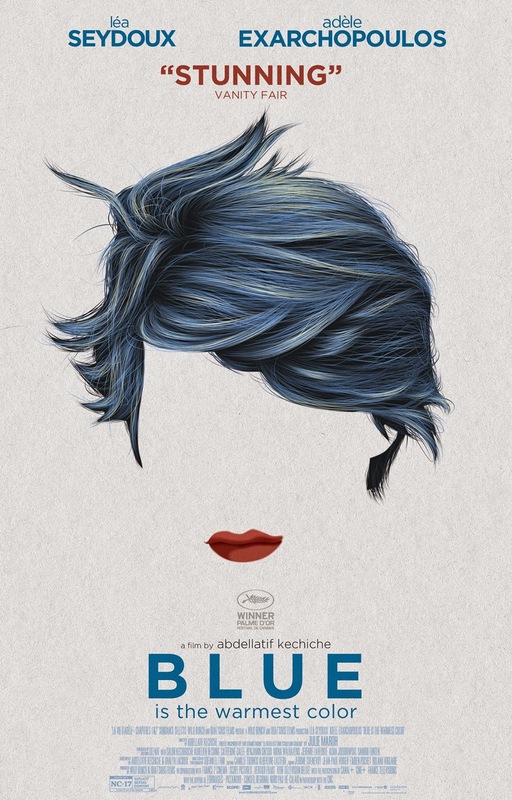 The raw and unequivocal emotional intimacy that Abdellatif Kechiche achieved, particularly through Adèle Exarchopoulos, was heart-tugging and heart-wrenching as the show progressed. Definitely the best film of 2013, beating out Oscar-winner 12 Years A Slave which had the historic scope and heft, but lacked the heart. This is a Romantic love story at its core, that is not defined by gender and or orientation. Just one individual trying to find her way through love and life. Like the original french title, this movie can be split into 2 parts/chapters. Both are sort of coming-of-age parts just at different stage in life. In Chapter 1, we are introduced to fresh-faced, cherubic Exarchopoulos as she comes to terms with her sexuality and ideologies. This part also foreshadowed the rest of the movie if you pay attention to certain details, especially the French Literature lessons and the discussions on Philosophy. However, it is the way Kechiche presented the budding romance between Exarchopoulos and Léa Seydoux that was sublime. The intimacy and rawness of those early trepidatious stages of meeting someone new and falling in love were so aptly captured on film. Chapter 2 was a different sort of coming-of-age. The progression from the idealism of youth to the reality of adulthood. Responsibility and self comes to the fore and we see Exarchopoulos' character struggle with that as her older partner seemed to ease into that transition. This part is where the Tragic (yes, also with a capital "T") component plays a major role. As we experienced the tragedy together with Exarchopoulos, the raw emotional grief and fear and depression wrecks her - and Exarchopoulos and Kechiche brought us together for the ride. Kechiche's writing can be overly heavy-handed at times, especially when he borrows the voice of his character to wax lyrically about philosophy. However, there are more times when he comes out with gems so simple (in their English translation) but yet so truthful. The use of the colour blue is a fine detail to explore as the vibrancy and intensity, and frequency of usage, is a visual barometer into the emotional heart of our lead character. Reminds one Picasso and his Blue Period. Luckily, the censorship was barely noticeable. However, the scenes that were sniped off do play a crucial role in the establishing the psychological frame of our lead character. As mentioned repeatedly above, Exarchopoulos was simply astounding. The controversy surrounding Director and Actor notwithstanding, Kechiche has given us a star. She deserves all the accolades that has been bestowed on her, and if the film was in the running for the last Oscar, she definitely deserves a nomination and a close second to Cate Blanchett. Seydoux was equally as mesmerising as Exarchopoulos, however, she had less material to play with and consequently less emotional weight to burden. Thus, as magnetic as she is on screen, Exarchopoulos frequently eclipses her. A nearly 3 hour drama that was definitely worth the time. Steven Spielberg, Ang Lee, Nicole Kidman and co were spot on when they chose this film as the Palme d'Or winner last year. Truly, one of the most Romantic film ever.